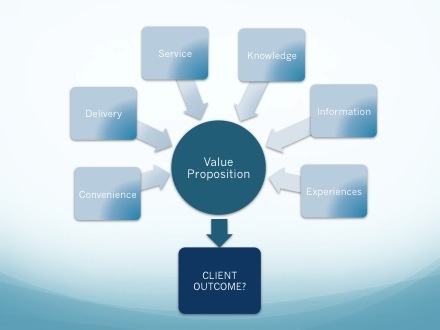 How to create a Value Proposition that works! Sales & Marketing for Professional Services & Strategic IssuesWhat corporates should deliver on social media	Sales & Marketing for Professional Services & Strategic IssuesWhat's the point of all this business effort? Creating a compelling Value Proposition is difficult, but if it is done well it will be central to a professional’s marketing. The Value Proposition is in effect your promise to your target market: “This is what I will do for you” is what it says in simple terms. To begin the process of crafting an effective value proposition you need to understand what things you do, or have, or know that can create value for clients. Convenience provided, or how particular services are delivered to clients are easy places to begin. Ongoing service can be valued in terms of client benefits fairly easily. The knowledge base of the professional has value, as does the way that knowledge base is shared in the form of content or information to clients. Client experiences (or feelings) from successful planning results, problems averted, or the simplification of otherwise complex issues are also areas that should be considered as part of a professional’s potential value proposition. The critical step in creating the value proposition comes once you have identified the possible areas of value that you create for clients. It is understanding what these things mean in the way of great client outcomes….”I achieve this desirable result for you” is what the value proposition really says. Once you have linked the fabulous things you do and have that result in a desirable outcome for your target market, you have a value proposition that will work because it speaks directly to your target market about something they value, and which you are confident you can deliver. You can then build your marketing around that value proposition.